NEW YORK, New York — The Telemedicine Program was presented and launched at the Medical Science Library of Armenia in Yerevan on May 27th. Telemedicine Program in Armenia was officially brought to life. The opening ceremony was attended by the leaders of the Telemedicine Program, Hayastan All-Armenian Fund US Eastern Region Affiliate’s board of directors chairman Mr. Khoren Bandazian, its executive director Ms. Irina Lazarian and a member of its board of directors Dr. Gevorg Yaghjyan, as well as the director of the Medical Science Library of Armenia Ms. Anahit Shirinyan, the CEO of Rostelecom Armenia Mr. Hayk Faramazyan and various media representatives. 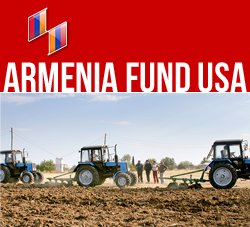 In his opening speech, Hayastan All-Armenian Fund US Eastern Region Affiliate’s board of directors chairman Mr. Khoren Bandazian expressed his thanks and briefly presented the Fund’s initiatives in support of Armenia and Karabakh. He noted that since the Fund’s inception in 1992, it had developed and implemented numerous projects in various fields ranging from education to construction. In his opinion, some of the most remarkable moments were the opening of the Stepanakert Policlinic in 2004 and following medical training of its staff, implementation of various education projects involving the expertise of foreign specialists (mainly from the professional network of Dr. Gevorg Yaghjyan), as well as the on-line medical diagnostic session held in New York in 2009. The presentation continued with the remarks of Ms. Irina Lazarian, the executive director of Hayastan All-Armenian Fund US Eastern Region Affiliate. She stressed that the project would be ongoing and would concentrate on three directions: education through online conferences, continuous medical education, particularly doctors’ training at regional hospitals and on-line medical diagnostics and consultation. Dr. Gevorg Yaghjyan, a member of Hayastan All-Armenian Fund's US Eastern Affiliate based in New York and also the project manager of the Armenian Fund's US Eastern Affiliate’s “Hyebridge Telehealth” program, added that Telemedicine Program had been operating in Karabakh since 2007. According to Dr. Yaghjyan, the treatment of cardio-vascular system diseases and cancer, which are the main causes of mortality in Armenia, were going to be the primary focus of the web conferences. The program is expected to involve leading Armenian doctors from Russia and the United States. Utilizing the Rostelecom’s “Video Call” service, the event was concluded with a web conference with the Medical Center of Kapan, which was the first teleconference of the program. Modern treatment methods of cerebral palsy were the major topic of the conference. It was conducted by the Chief Neurological Surgeon of Armenia, PhD, professor, Dr. Ruben Fanarjyan.